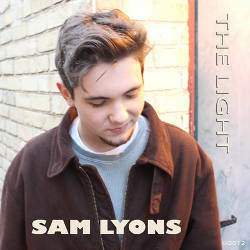 17-year-old Sam Lyons releases second album, "The Light"
?MI: How did you get started in music? Sam: Well, I was born into a musical family. We always had a piano in the house, and my brothers and I all took lessons - at least for a year. And we had a drum set, guitars, and basses. I guess it was just all around. My dad is a bass player/trombonist who has worked with everyone from Butch Vig to Clyde Stubblefield. He has been active in the Madison music scene for about 30 years. My oldest brother (Clay) is a jazz saxophonist in Boston and my middle brother (Isaac) is an up-and-coming hip hop artist: Duke Daeo. It was a very inspiring atmosphere to grow up in.
? ?MI: What about singing and writing songs? Sam: I started on guitar when I was 7. My dad showed me how to do simple bar chords - root, fifth, octave - so I started figuring out songs and playing them. Everything from Fountains of Wayne and Smash Mouth to Ray Charles. That led to writing my own songs - I take great pride in it. A lot of popular artists nowadays don’t write their own music and I want to change that. MI: Where did the jazz influence come in? Sam: Growing up, my parents listened to all types of music. Classical, jazz, motown… everything. My dad used to play more jazz when he was younger, too, but my oldest brother Clay got into jazz saxophone heavy from about 9th grade on, so he had Charlie Parker and John Coltrane going 24/7. For me, on guitar, I took a few lessons from Louka Patenoud, and later, Roger Brotherhood, but mostly I just heard it and figured it out. Getting into the Isthmus High School Jazz All Stars my freshman year was big, too. Dan Wallach, the director, who teaches at Edgewood College, taught me a lot also. I was lucky to have many of my best friends into music too - jazz and other stuff - like David Van Den Brandt (bass) who was in every band with me - one of my main collaborators, for sure.
? ?MI: You self-produced both of your CD’s. How did that work?? Sam: I’ve got a set up with a used Mac, an Mbox, and a couple of mics in the beginning and learned how to use it all. You can get pretty good sounds with digital recording on a computer these days. Now we have a slightly bigger set up, but it’s still pretty simple. I recorded all of my acoustic album “Someday” and 90% of my new album “The Light” at home. The only things I didn’t record at my house were the drums, which we did at Soundgarden Studios. After getting all the recording done, I went to Soundgarden studios to mix and master the tracks with Ken Koeppler. I mixed my first acoustic album at Smart Studios with Mike Zirkel. MI: Your new album is mostly you singing and playing all of the instruments, but has some guest musicians also. How did you make decisions about that? Sam: Well, it was natural for me to do the singing and play the guitars. I played most of the bass tracks, too, to figure out what I wanted - then I wanted my dad to redo them. He said most of them were good and I should just re-record them with his good bass. For drums, I started out with computer generated drums, then I had my friend Chris come into the studio and do the real drums over the tracks. He’s a Middleton friend who was in Moonjelly and the High School Jazz All Stars with me. He’s a music major, now, at Northern Illinois. For keyboards, I played some of the basic tracks, but had my friend, John Nelson, also from Moonjelly and the High School Jazz All Stars, play the serious stuff. John is a great pianist who is now a sophomore studying music composition at Ball State. The horns were Al Falashchi and Jim Doherty from Phat Phunktion along with my dad - they are in Steely Dane with my dad. Jim actually played a solo on my first album, too. And my big brother Clay played a solo on one of the songs when he was home for a week, last summer.?? MI: You do a very unique cover of a Beach Boys tune. Where did that come from? Sam: I actually had a solo gig playing at a friends paddleboard company, and I had to learn a bunch of classic California surf songs. I ended up learning some Beach Boys songs and “Wouldn’t It Be Nice” was the one of them. After learning it, I had the idea of doing a cover of the song, but making it more groovy. I was inspired by D’angelo’s creative covers. I loved the way he could totally switch the direction of the songs and make them original. This song is getting some airplay on TripleM, so that’s pretty cool. I also recently made a video for youtube of me playing all the instruments and singing. ?MI: Who are your favorite artists or biggest influences?? Sam: Stevie Wonder and D’angelo, they are both the triple threat. Amazing singers, amazing musicians, and amazing writers. ?MI: You’ve performed at some pretty big venues for a guy your age. What stands out as the best?? Sam: Doing the 2010 MAMA’s award show with my former band, Stereocolor, at the Overture and getting a standing ovation was pretty cool - the crowd’s energy was an unforgettable experience. And the Launchpad stuff at the Union Theater was cool, too, because of the big crowd dancing, but there was this one time Stereocolor went to an open mic at the Memorial Union Terrace, and all these college kids were totally into us and dancing - new fans - we could have sold a bunch of CD’s if we’d had ‘em. I was probably 15. MI: Your two brothers are both active musicians. What are they up to? Sam: My oldest brother, Clay, is a jazz saxophonist who is in his last semester at Berklee in Boston on a full scholarship. He just got back from playing the Panama Jazz Fest - He opened for Wayne Shorter and he also did a gig down there where his band backed up Ruben Blades. He’s been traveling all over on Berklee’s dime - they’ve sent him to Italy and Hong Kong, too. My other brother, Isaac, has been doing a lot of recording - hip-hop stuff - he put out an excellent album last year - Duke Daeo, “Further Definitions”. He also is part of the “21st Century Crew” and he just got back from South By Southwest in Austin where he performed with a group called, “Higher Education Records”. MI: You’ll be graduating from Middleton high school in a month. Is there college in your future? Sam: Well, I’m actually taking a couple music classes at Madison College this semester - Music Theory which has been really good. Next fall, I’m going to Berklee College of Music (Boston) as a songwriting/contemporary music major. They gave me a nice scholarship - not quite shredding-bebop-saxophone money like my brother, but pretty good. MI: I heard you’ve made a connection with Leo Sidran. How did that develop? Sam: Leo’s dad, Ben, heard me perform last June at the Isthmus Jazz Fest at the Union. He told Leo about me and then they both came over to my house to check out my stuff when Leo was in town, back in September. He liked my work and might help me produce some songs and get my stuff out there to some A&R people. Leo moved to Brooklyn after he won his Oscar (Motorcycle Diaries soundtrack) - I’m very thankful because the Sidrans have turned out to be one of my best connections. MI: I also saw that you are a MAMA’s finalist in a few categories. Tell us about that. Sam: The MAMAs are a great organization with their charitable mission of putting instruments in kids’ hands. Rick Tvedt and Roy Elkins have been really good to me. This year I’m up for awards in 4 categories - Best New Artist, Pop/R&B Album (The Light), Cover Song (“Wouldn’t It Be Nice”) and Jazz Song (“Superficial Girl”). People can vote at www.broadjam.com/mama/ . If you didn’t vote in the first round, you have to do a quick registration, which includes a $5 donation to the MAMAs charity. My brother Isaac (Duke Daeo) is a finalist in the Hip-Hop categories, too. Vote for him also! MI: Do you plan on supporting your new album with live performances? Sam: Yeah, we did a CD release party with the new 6-piece band back in March at the High Noon Saloon, and I’ve had some other gigs - some solo acoustic, and some with a trio or quartet. The new band is sounding great. It’s Dave Adler (The Gomers) on keys, Chris Di Bernardo (Moonjelly) on drums, Al Falaschi (Phat Phunktion) on sax & vocals, Will Green (High School Jazz All Stars) on sax and guitar, and my dad Phil on bass and vocals. I have some other gigs coming up, too - Lilianna’s (Fitchburg), the CamRock Cafe (Cambridge), and the (Crossroads Cross Plains). It’s all on my website and facebook - samlyonsmusic.com? ?